Also part of the Missouri Teachers Academy this year we broke off into groups and did a more personal learning project based on a book of our choosing. 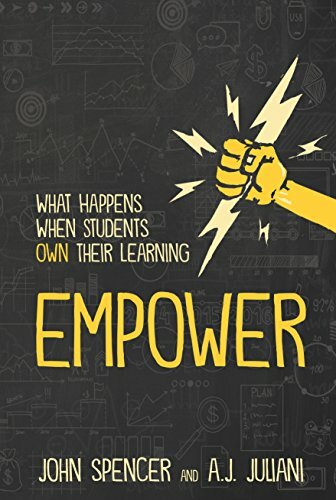 My group chose to focus on student engagement and found the book “Empower” to guide us in our learning. It’s a super easy read and I highly recommend it as a motivator for giving up more control of class time and letting students’ own passion guide the learning. I think this wisdom is paramount when teachers consider what takes place in their classrooms every day. I hear a lot of teachers talk about sticking to this or that curriculum and never giving up control of their sacred lesson plans, but I think in reality this stubbornness in regards to teaching only limits what students will take away from the learning. Instead, teachers should be willing to let student interest and passion guide at least part of the classroom experience. In this way, students become active leaders and will gain far more practical skills instead of only content knowledge. 1. Students are the center of learning, so why not let them lead? As the title of the book suggests, it’s teachers’ job to empower their students to become curious and engaged in the subject so that they lead their own learning. A.J. Juliani says it best with “it’s not about giving them a roadmap for learning. It’s about helping them create their own maps.” Instead of focusing on specific content that all students should learn, teachers should allow students to find their interest in the subject and come up with how they will demonstrate their learning. Through this process, students can obtain invaluable skills applicable to solving real-world problems they will face after school. So, through classroom empowerment teachers help create world leaders. 2. Learning is all about creating. The book points out a staggering fact about our students: they passively consume information constantly–whether through television, cell phones, the internet and video games. Yet, not surprisingly, students rarely create their own television show, cell phone apps, internet site or video game. That’s why another major concern I have when talking to other teachers is how little opportunity they build into their classroom time for students to actively create. Learning is all about trial and error, experimentation, and tinkering, yet by the time students reach high school it becomes mostly bookwork and memorizing notes. How can teachers build more active learning into their subjects? Most just haven’t thought about how to adapt their lessons to fit with modern technology and workplaces. So the trick for teachers is to guide students as content creators in their subject area. 3. Failure is a critical part of learning. Content creation is critical, but no one produces their best work in one draft. Rather, learning is a cycle of production, evaluation, revision, and publication. This is how teachers should mimic learning in the classroom, so that students become accustomed to failure and constructive feedback in regards to their work. This process helps develop resilience and growth mindset, two key components of successful leaders the world round. Overall, the book “Empower” was a motivating read and good reminder for me of how to best serve my students. Next year I hope to engage my students more by letting them lead in the classroom and connect their passion to my subject.